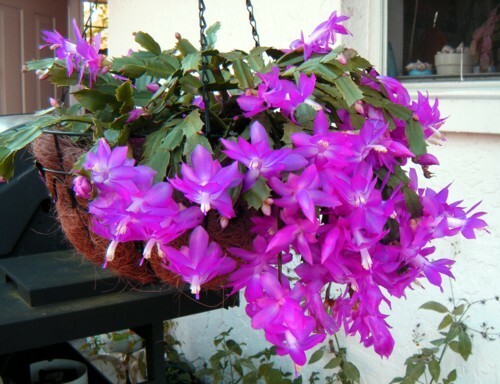 The Christmas cactus (Zygocactus) is native to the South American jungles. The flowers bloom once a year and come in shades of fuchsia, yellow, salmon, pink, white, orange, red and sometimes will even have a combination of the colors. The Christmas cacti are tropical plants. They require sunlight and the blooms last longer with cooler temperatures. Keep them away from heaters, fireplaces, radiators, furnace ducts, and other heat sources. Place in a sunny location while indoors and if outdoors during the summer, find a place that has a sun/shade mix to prevent the plant from getting burned. The best way to be sure your plant is getting just the right amount of water is to wait until the soil is dry on the top and still a bit moist toward the bottom. Then water the plant until the soil is saturated. Drain off any excess water that accumulates on the bottom. Then do not water again until the top half of the soil feels dry to the touch again. Well-drained soil is very important. A high quality cactus mix is great. If you can&#39;t find any that is made for cactus you can mix two parts regular potting soil with one part coarse sand. In order to insure your plant will bloom in time for Christmas, you will need to give the plant a rest period. Cut back on the watering leaving the soil only partly moist. Allow at least 14 hours of total darkness for the plant at night and sun during the day, until the buds begin to form. Start the dark period in early September. Once the buds form they can take from 10 to 12 weeks to fully bloom. After the Christmas cactus is done blooming you can prune it to incourage new growth. You&#39;ll also find that the plant will bloom better next year if it is trimmed. As new growth appears in the spring, put a diluted solution of liquid houseplant fertilizer 2 to 3 weeks after the start of the new growth. The cactus should be repotted every 2 to 3 years depending on how depleted the soil is. Repotting should be done in the spring.